Since more than 50 years the coffee blends produced by Torrefazione Poli reflect in their body, flavor and taste the most classical tradition of the Italian espresso. Indeed, the blends are esclusively made with the best qualities worldwide of Arabica and Robusta, and they are intentionally and expertly prepared to fulfill the needs of the market, from the vending machines to the most refined and demanding customers used to an espresso coffee made by professional devices. 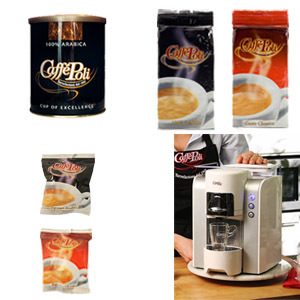 Vending blends, Horeca blends, capsules, pods, coffee machines, moka coffee, espresso coffee machines, tea and infusions capsules, chocolate.